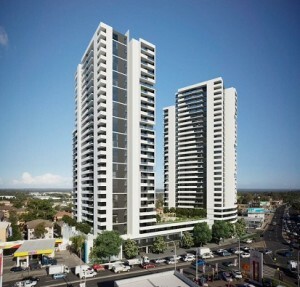 Aiming high: the Skyhaus apartment towers proposed for Liverpool have received the green light. Liverpool is set to get a brand new landmark: a very tall landmark. 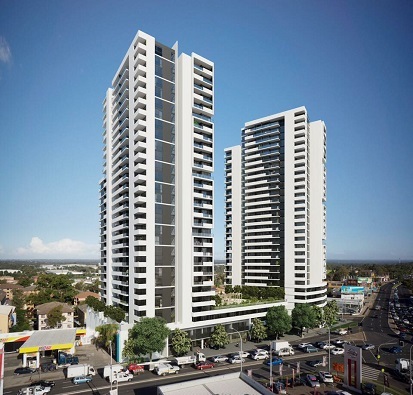 The application for the $100 million, two 29 storey apartment towers project opposite the old Hollywood Motors site on the Hume Highway received the green light on Friday. The Joint Regional Planning Panel, or JRPP, which looks at state significant projects valued more than $10 million, agreed the proposal can now proceed to the next stage. This makes it all but certain that the project, marketed as Skyhaus, will become a reality in the next few years. Property developer Lateral Estate is behind the huge project, which will increase the height of Liverpool’s central business district skyline by more than double. The tallest office towers in the CBD at present are 12 storeys, so once opened Skyhaus will completely dominate the sky around Liverpool. It could also on completion become the new landmark of Liverpool. Ironically, the development is opposite another Liverpool icon, the Collingwood Hotel. The Skyhaus site borders the Hume Highway, as well as Mill Road and Macquarie Street. It will include a small amount of ground floor retail/commercial. Project architects are leading Liverpool firm Mosca Pserras Architecs. Skyhaus apartments will command views of the Sydney city skyline to the east and the Blue Mountains to the west.